Don’t know about Acid Wash Expert ? When it comes to getting stains off the surface of a pool, nothing works like an acid wash . And I mean the traditional ‘drain it, clean it, and refill it’, acid wash that we’ve been doing to pools since we figured out how to do it. So, that’s the best way to get staining off. Acid washing is a potentially dangerous proposition, things can happen to the pool with when the water’s taken out. The weight of the water holding everything in place, once that’s gone, things can happen. Blisters under the plaster can form or become apparent, there can be little pinholes in there that will cause that, also just if the ground were saturated around the pool. When the pool was drained. There’s the possibility that it could actually pop the whole shell up from the ground a little bit. How do we make sure that these things don’t happen and what do we do? Well, for a plaster that’s damaged below the surface of the water. There’s no real good way of knowing that that’s the case. So it’s possible that there could be a little pinhole in the plaster someplace where a bit of water has gotten between the plaster and the gunite underneath, and once you drain it. That pinhole will allow some air in and the blister forms. Whereas before it was not really apparent. Now, when we don’t want to acid wash a pool is when the surface of the plaster. What would be the cream, when they’re finishing it. When that little bit of it pops off, revealing a more textured plaster below. When this happens, it is not recommended to acid wash the pool. The fact that the cream on top -The process is called the elimination, it’s when the cream on top expands or contracts in a way that separates it from the rest of it from the rest of the plaster underneath. There’s much debate over whether this is caused by over-trowelling. When the plaster’s put on, or whether it’s water chemistry, or some other kind of change later. It commonly occurs on the steps or other areas where there is a lot of wear and tear. And where there may be temperature variations. In other words, the top step, is the most susceptible to this, and the temperature variation on the top step could very well be the issue that would cause this kind of thing to happen. Of course, it does happen in other places in the pool, and other common places down near the drain, where probably like acid is added to the pool, without the pool running, and that acid just kind of collects down in the bowl and it dissipates from there eventually, but while it’s sitting down there, in stagnant water, it’s doing some damage to the plaster. This is why you should always run your equipment for an hour or so after you add chemicals, but nevertheless, these things make it so that the pool isn’t a good candidate for acid washing, causing further damage and essentially destroying the plaster altogether. So, people that want their plaster clean, but it’s already falling apart. I tend to disappoint them by declining to clean their plaster, rather suggesting that they save their money. Because if the appearance is bothering them before an acid wash, with the plaster popping off like that it would be even worse. Now, understand this clearly, most pools you can acid wash and everything works fine. The acid wash does etch the plaster a little bit. Which is why it’s not really particularly good on tile. The tile has got the glaze on the surface, which is like a glass finish. Well, the acid doesn’t take any of the glass at all. But it will take a little bit of the plaster with it, therefore revealing the clean plaster underneath. 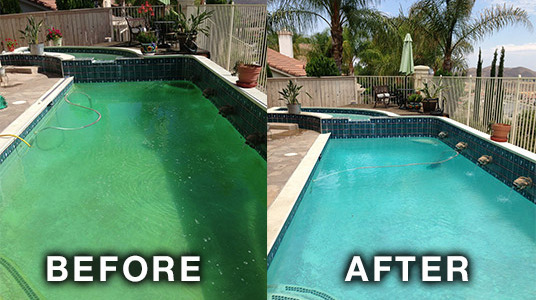 How we remove Stains from Your pool. That’s how the acid wash works, you know, you scrub the whole thing down with the acid.Most softer things, softer than plaster, will just dissolve right away and wash right out. But a little bit of the plaster comes with it, and when that happens. Then that’s the other reason why you can’t acid wash a pool where the plaster’s falling apart. It’s just not advised to do that. But it’s also why it doesn’t work on the tile. For tile cleaning, the recommended thing, with calcium deposits. The recommended thing is to have a bead blaster or some other type of cleaner, such as soda ash or something like that used on the tile that will. It’s actually used on the calcium itself to set up a vibration. Where the calcium releases itself from the glaze of the tile. So you’re not actually cleaning the tile, well, you’re not actually trying to go at the glaze itself. You’re simply allowing the calcium that’s on the surface of it. To release itself from it, and then a good treatment for that after the step of cleaning is a spray of silicone, a light coating of silicone over the tile. And that helps it to resist further calcium build up, for about a season. It’s not like you put it on there and then that solves the whole calcium build up problem. In Phoenix, we have calcium in our water, and it tends to build up over time. Of course the water evaporates and the metals, the calcium, the copper, the iron, or whatever else, is left behind. We provide you the Solution. Phosphates and all kinds of things in the water, and so the acid wash actually takes a little bit of the surface off, but it’s recommended as the preferred technique to clean, so don’t think that because it’s going to do this to your surface that that’s necessarily bad or wrong or anything else. The water chemistry, on a constant basis, is taking material from the walls, from the plaster and depositing material back onto the plaster, there’s just a PH fluctuation in the water, all of the time, that causes it to be active and to do these kinds of things, and the way to clean it is to acid wash it. Hire Our Experts for your Pool Cleaning. 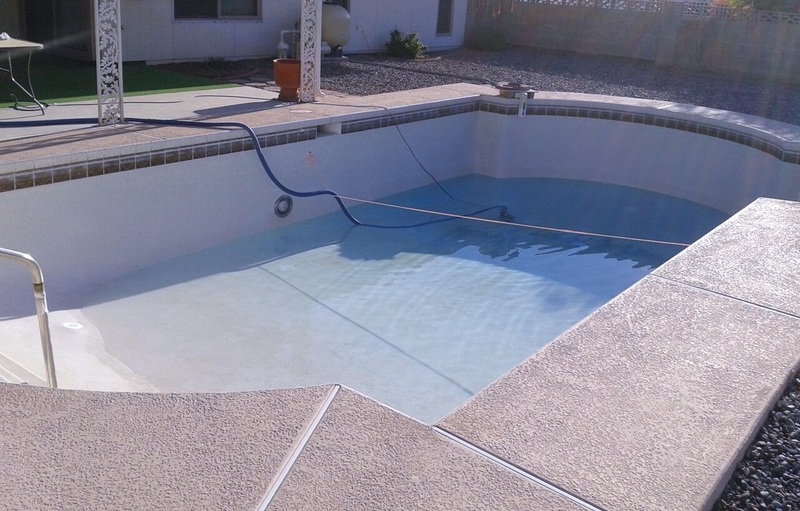 A phoenix pool acid wash expert uses a special bunch of ingredients, some special additives to the acid wash, and a mild concentration of acid. with some particularly good metal bonding agents to help to pull all of the metals out, and some agents that cause the acid to adhere to the surface and work better, longer. 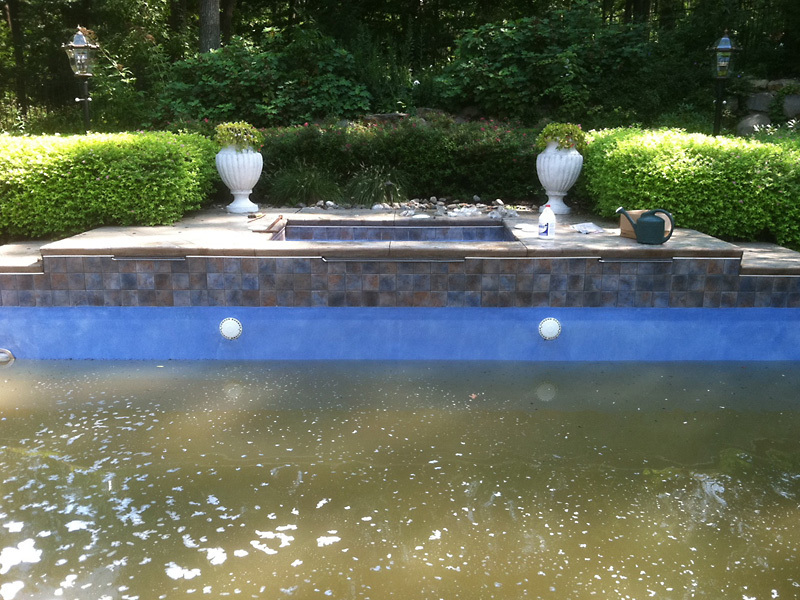 So, if your pool is looking, you know, not so clean, give us a call now.